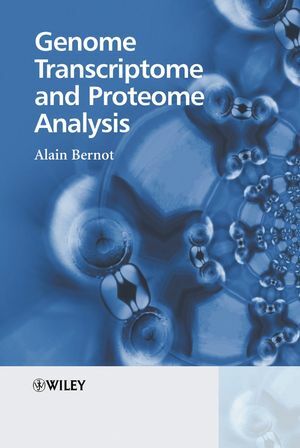 Genome Transcriptome and Proteome Analysis is a concise introduction to the subject, successfully bringing together these three key areas of research. Starting with a revision of molecular genetics the book offers clear explanations of the tools and techniques widely used in genome, transcriptome and proteome analysis. Subsequent chapters offer a broad overview of linkage maps, physical maps and genome sequencing, with a final discussion on the identification of genes responsible for disease. An invaluable introduction to the basic concepts of the subject, this text offers the student an excellent overview of current research methods and applications and is a good starting point for those new to the area. Alain Bernot is a graduate of the école normale supérieure, PHD, and Professor at the Université d'Evry. He is currently working in a genetic therapy programme at Genethon. He previously directed the sequencing and analysis of a vertebrate genome (Tetraodon nigroviridis), and contributed to the identification of a gene responsible for a human genetic disease (Mediterranean familial fever). 1.1 Revision of molecular genetics. 1.2 The tools of molecular biology. 1.3 Specifics of the genome programmes. 2.1. Tools and methods in genetic mapping. 2.2 The development of genetic maps. 3.1 Local maps or small genomes. 3.2 Strategies for physical mapping of the human genome. 3.3 Maps of the human genome. 4.3 Genomes of model eukaryotes. 5 Sequencing cDNA and the transcriptome. 5.1 Strategies of cDNA sequencing. 5.3 The analysis of cDNA sequences. 6.4 Two-dimensional electrophoresis and identification of proteins. 6.5 Identification of protein interactions by twin hybrids. 6.7 Analysis of three-dimensional structure. 7 Identification of genes responsible for disease. 7.2 Functional cloning and chromosomal anomalies. 7.3 Strategy for positional cloning. 7.4 What is the future for the cloning of disease-causing genes?